Takes them to the torrent's door. Then in evil's clutches bound. The genie's magic rudely spelled. The three friends try to look for a way past the massive waterfall, but there is no visible pathway. Stumped, Richard asks Melek to consult the Book of Prophecies. 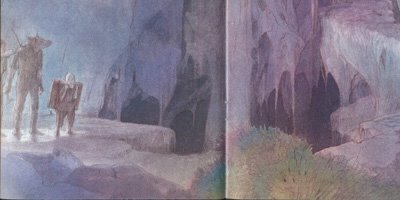 After reading the prophecy, he takes another look at the waterfall and sees something he didn't notice before: a slim ledge running along the walls of the rocky face and towards the waterfall. He excitedly points it out to his friends. The ledge is fairly narrow and looks dangerous, but they decide to risk it. Richard goes first along the edge, followed by Orkan and then Melek. At first the journey across the ledge is nerve-wracking, especially as the ledge climbs gets higher above the water below, but eventually the ledge widens and grows easier for them to manage. Eventually, they reach the falling water itself, and Richard takes a step inside. The wall turns out to be a curtain of water, and the three pass through fairly easily. They emerge in a tunnel that slopes upward into the mountain. With the path ahead of them, the three start walking in the strangely lit corridor. After a while of walking, they find a small wisp of smoke rising from the floor ahead. As they watch, the wisp suddenly grows in size and a white shot of vapor spills out. The smoke begins to shape itself into that of a creature, one with an upper body and nothing but smoke for a lower body. The creature's final form is that of a genie. The genie identifies himself as Syrus and demands to know what Richard and his friends are doing in his realm. Richard tells the genie they are trying to reach Wizard's Well and do not wish to disturb him. The genie laughs, saying he knows why they are trying to reach the well and points a finger directly at the trio. The three freeze where they stand. Syrus smirks and causes multicolored ooze to emerge from the floor and surround the trio. Moments later, the three are wrapped by the giant hand of Syrus, who sneers at his captives before carrying them down the tunnel. The same smoke follows closely, obscuring the three's vision and blurring their senses. After a while, their captive lets them go and the smoke clears. The three find themselves in a room decorated with fancy silk and rugs. Syrus floats before them above a carpet of small bubbles with tiny people inside them. Syrus declares that this is the trio's final drestination. Orkan tries to launch an arrow at the genie, but Syris points a finger at them. An instant later, the three find they have shrunk and are stuck inside a bubble like the ones on the floor. With a cackle, the genie disappears, leaving the trio trapped in the bubble. The three try to break the bubble with their swords, but the bubble is rubbery and refuses to break. Defeated, they decide to see who is trapped in the other bubbles and roll over the floor inside the bubble. 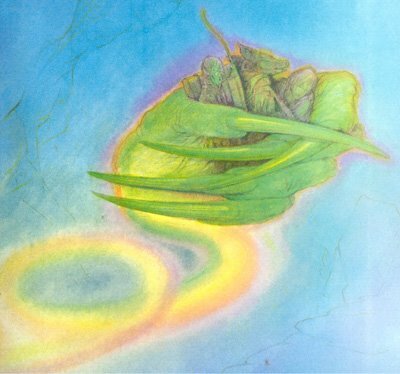 When they reach the other bubbles, they look inside and Melek recognizes the people inside. They are Melek's people, the Landsmen. 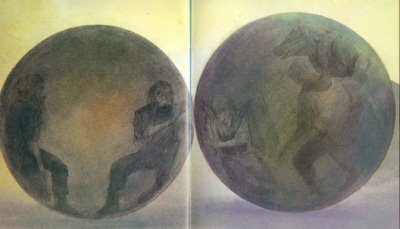 Melek strikes up a conversation with one of the Landsmen inside one of the bubbles, and the trio listen to the man's tale of how they were captured by Syrus. The man reveals that the genie is holding them captive until the Evil One arrived to put them under his spell, and that only magic could hope to break the bubbles. Realizing the Evil One mustn't find them here, Richard tries to think of a way out when he remembers the prophecy. They remember prophecy's verse and figure out that saying the name of someone backwards three times is the key to breaking the bubbles. The trio give it a go, saying their names backwards three times, and the bubble that holds them bursts. Excited, Richard calls to the other Landsmen to do the same, and soon the room is filled with nonsensical words being spoken aloud. One by one, the bubbles burst until none remained. 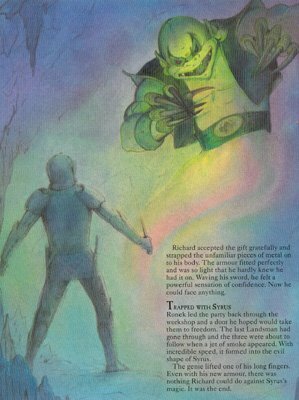 The leader of the Landsmen, one called Ronek, approaches Richard and thanks him for freeing them, though points out they all still need to reach their original size. The prophecy doesn't mention anything about this, so the tiny heroes resort to searching Syrus' cave. There is a single door inside the chamber, and the trio and swarm of Landsmen head straight for the slightly ajar portal. They find no one inside, but they do find several shelves holding countless bottles of potions. The bottles contain no labels, but Richard and his friends climb up a shelf to take a look anyway. After a bit of searching, Richard sees a bottle and his instincts tell him that this bottle contains the potion that will restore their height. With the help of some Landsmen, Richard tips the bottle over on its side. He opens the stopper and a pink liquid pours out. Richard takes a small sample of the liquid and rubs it on the back of his hand. Moments later, Richard suddenly shoots upward and he returns to his original height. Quickly he grabs the bottle and pours its contents on the ground beside the army of Landsmen. The Landsmen mimic his actions, and soon everyone else has reached their original height. Richard says that they need to leave before Syrus returns, but the Landsmen first need to collection their weapons. They all hustle back into the first room, where against one wall several pieces of armor and weapons lay scattered. The Landsmen quickly collect their belongings, until only a single armor remains, one that belonged to one of the Landsmen's greatest warriors before he was killed by Syrus. With their blessing, Richard takes the armor and puts it on. The armor, despite its size, feels incredibly light, and Richards feel confident in taking on anything. With their weapons collected, the Landsmen start hustling back through the potions workshop and towards another door that hopefully leads to freedom. 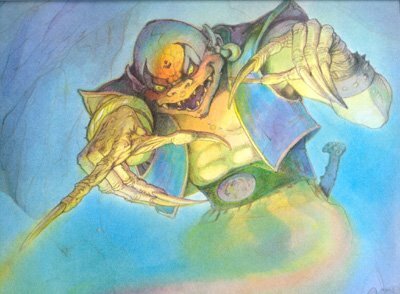 As the last Landsmen disappears through the door, a familiar smoke appears and morphs into the form of Syrus, blocking the three's pathway. The genie points a finger at Richard, and Richard feels helpless to do anything against the magical being. 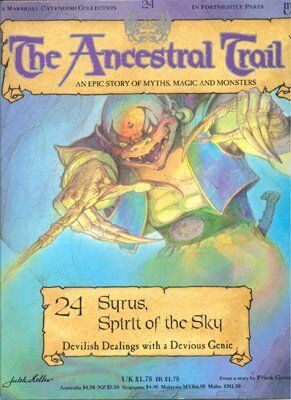 Syrus is a powerful genie that dwells within the mountains that house Sorcerers Falls. Like many of the evil creatures in the Ancestral World, Syrus holds allegiance to the Evil One. 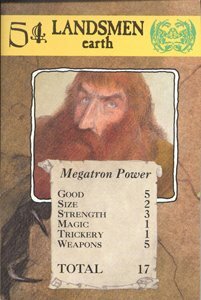 He is considered very powerful in terms of magical ability, but he also has a workshop where he contains many potions that also perform magical tasks. Syrus' most recent duty was capturing and imprisoning the remaining armies of the Landsmen, holding them until the Evil One arrives to collect them. "The smoke began to mould itself into another shape. First a round, bald head with pointed ears and a cruel mouth appeared. Then came broad shoulders, set above a muscled torso that shone as if it had been oiled. The lower half of the apparition was nothing more than smoke. The creature was a genie." The Landsmen are a race in the Ancestral World that closely resemble humans in shape. Their stature makes them similar to dwarfs in size, though they are apparently slightly larger. 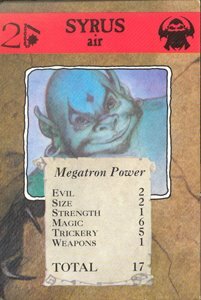 It can be assumed that they are closely related to the dwarf forces, who were placed under a spell by the Evil One and put in the care of Zock before being freed by Juroot. The Landsmen were captured by Syrus and imprisoned in the genie's stronghold, presumably to hold until the Evil One arrived to put them under the same spell as the dwarfs were once under. For the twenty-fourth issue of The Ancestral Trail, the issue's monster is that of one found in real world myth: the legendary genie. Syrus is a fairly interesting foe, because he has the potential to be quite menacing. Genies are thought to have unlimited powers, and during the brief time we see Syrus we can tell he's able to perform some powerful magic with the simple point of a finger. With that in mind, Syrus also seems to serve the Evil One, or at least he is in cohorts with him. This brings up the question: what if Syrus were just as powerful as the Evil One? How would that dynamic work between the two? The enslaving of the Ancestral World takes an interesting turn when Richard and his friends find the Landsmen captured by Syrus in those bubbles. By now, the Evil One has to be panicking. Richard has freed all but one Guardian, retrieved all but one Life Force Pod, killed many of the evil creatures that roam the world, and freed many enslaved races. The fact that Syrus is holding the Landsmen captive but that the Landsmen are not under the Evil One's spell suggests that the Evil One is trying to recover his losses. 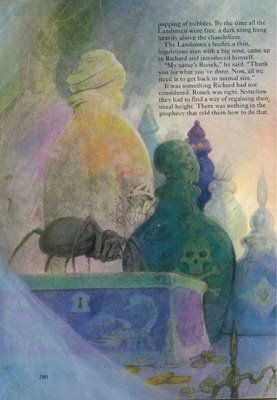 All of this leads to the inevitable final battle for the Ancestral World, just as soon as Richard retrieves the final Life Force Pod at Wizard's Well. Syrus: "Who dares enter the realm of Syrus, spirit of the sky?" Richard: "We mean you no harm, Syrus. We only want to reach Wizard's Well. We apologize for coming into your domain uninvited. Please allow us through." Syrus: "You can't fool me. I know why you want to get to Wizard's Well." "I think it's time you learned a lesson." "This is your final destination. I hope you like it - you're going to be here a very long time so get used to it." "This belonged to one of our greatest heroes. He was killed when we were captured by Syrus. Now it is yours."